Text on sarcophagi: “Sarcophagus is derives from an old Greek word meaning “flesh eating”. It is a special receptable for a corpse, made of terra cotta, stone, wood or marble and is generally decorated. Beside the terra cotta sarcophagus used in Minoan and Mycenaean civilizations, sarcopgus with different features existed in Anatolia during different periods. Clazomenai became an important center of trapezoid sarcophagi and painted or (sic) rectangular sarcophagi in Late Archaic Period. The stone sarcophagi with the relief in the 5th century were built by the Greek masters for the kings of Sido. Lycian type sarcophagi existed in the 4th century BC. They are narrow and long in proportion. They have gable-shaped lids with ridge tiles. They are either a copy of a building forming a construction or a simple chest in shape. 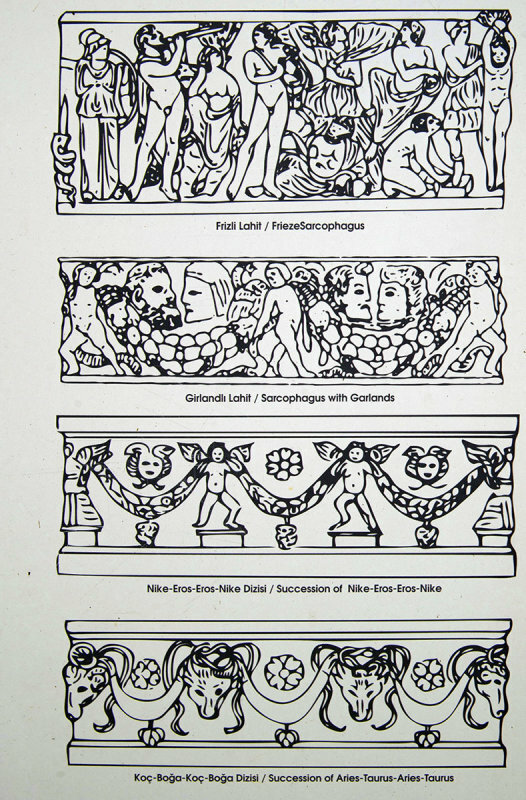 Two types of sarcophagi in Pamphylia and Sidemara type developed in Roman age. The lids of Pamphylia type sarcophagi is in the form of a roof with a triangular pediment at each short side. The body opf this tomb was decorated with garlands and reliefs belonging to the dead. The lid of the Sidemara type is in the form of a bed. While the deceased and his wife (if there was) was in pose lying above the sarcophagus, on the main scene, deceased, god, temple and medallion are depicted. These are columnar sarcophagi.